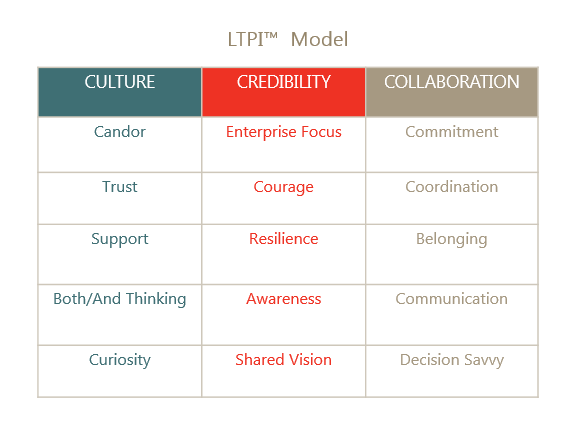 The Bates Leadership Team Performance Model and LTPI™ (Leadership Team Performance Index) Assessment offer a unique perspective and way to measure what is emerging in the literature as essential to high performing teams today. Several features set apart this model from others. 1. Looks at the team "as a whole"
Unlike most team assessments, the Bates LTPI™ looks at a team as a unit that exists for a common purpose and must coordinate to accomplish its goals. We developed the LTPI™ to look at the team itself because the effectiveness of a team cannot be fully understood only through assessment of individuals on that team, though this is often the method used. The LTPI™ does not evaluate preferences or personalities of individual members. The underlying philosophy is that a team is not a sum of the individuals, but a sum of how they behave together. Because organizational structures are changing, becoming less hierarchical and more networked, the Bates approach takes a fresh look at the leadership requirements in organizations today. Assessments developed a decade or two ago may not fully measure all that is required of teams now. The facets measure and address emerging organizational challenges such as Both/And Thinking, Belonging, among others. The LTPI™ report on team performance is interpreted in the context of the business goals, strategy, challenges and desired business outcomes. No two teams face the same situations, have the same goals, or the same members; there is not one formula for success. The Bates approach assumes that each team has a unique set of strengths and areas for development. One size does not fit all. The Bates LTPI™ is a multi-rater (360) survey of others’ perceptions of a team’s behaviors. We built the LTPI™ to complement the ExPI™, to measure differences in perception and intention about the individual, and now, the team, to uncover the blind spots. The ExPI™ and LTPI™ assessments offer a more precise way for leaders and teams to understand exactly what to do, to alter perceptions and be viewed as more effective. The Bates LTPI™ assessment was designed to align with and link to our research-based Executive Presence Index (ExPI™) that is now deployed in dozens of global companies, with coaches in 16 countries certified to use it. The complementary nature of the two assessments is intentional and enables us to deepen the insights leaders can glean. When both assessments are deployed, we can highlight the interplay of individual and team behaviors and offer individuals a specific path for development that will in turn make them more effective team members, as well as individual leaders.